Unlike most competitors who win the big one in the prime of their career and with support from the factory, Chris Evans on June 30, 2002, won his first AMA Pro National ½ mile event at Allen County Fairgrounds, Lima, Ohio, (his favourite track) one month short of his thirty-ninth birthday; well past an age when most riders have won their last. The win set a record in 2002 that most people aren’t even aware of – being the oldest rider in AMA history to win their first National race. This same man set another record in 1979 when at 16 years of age, Chris was the youngest person to ever receive the coveted CMA White Memorial trophy awarded to the competitor who scores the highest points in a year in all competitive events with 136 points. Chris Evans was born July 21, 1963 in St. Catharines, started riding at eleven and won his first race at age 12 on a TY80. In 1978 he switched to Dirt Track and Ice Racing and has never looked back. Chris’ father, George has been his biggest supporter, accompanying Chris to most of his events and between the two of them, building and maintaining their own equipment and mostly on their own dime. 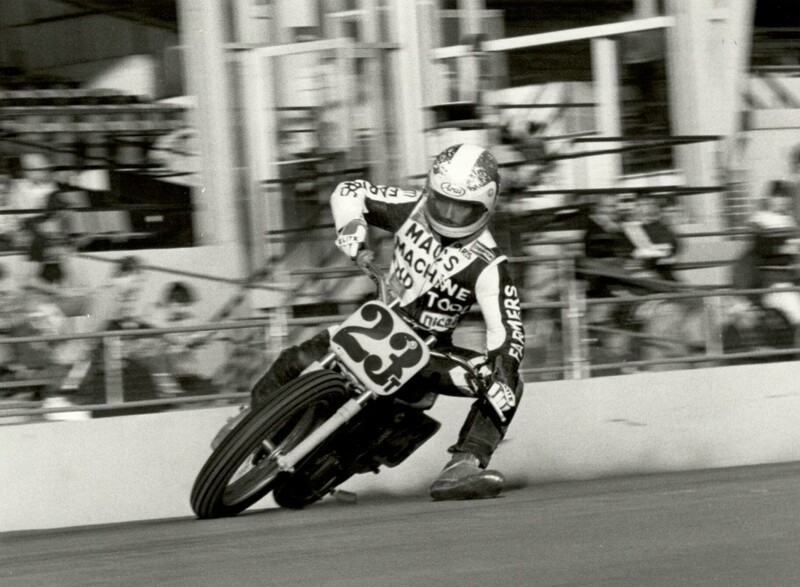 In 1980, with a handful of junior and senior championships to his credit, Chris moved to Expert dirt track. By 1982, he earned his first #1 plate for Expert Dirt Track and repeated his success with the HD XR750 winning the CMA #1 Plate again in 1983, 1984, 1986, 1994, 2001 and 2006 and CMRC in 2004. His last #1 Plate for Dirt Track came in 2012 at the age of 50. Hundreds of trophies fill the recreation room and spill out into the halls and other rooms. Over the last 40 years, Chris has won 24 Canadian National Dirt Track Championships, over 20 Provincial Dirt Track Championships and 5 National Ice Racing Championships. The White Trophy, awarded by vote of the CMA Directors to the outstanding racer in Canada in recognition of his successes has been awarded 3 times to Chris. Evans was the first to break the dominance of the Quebec riders in CMA National Ice Racing riding the Jim Sehl tuned Wood Rotax four stroke as well as Kurt Biegger’s Honda CR500 and taking the #1 Plate in 1985, 1991 and 1992. He was invited along with Jon Cornwall to ride for a Swedish team in the intense world of spiked tire ice racing but Chris was doing so well in ice racing here that he decided not to go. Cornwall competed for two seasons and in retrospect Chris has regrets for not going. Chris with his father George have put on over half a million miles travelling to events all across Canada and into the US. In 1986, he tied with Steve Morehead as Ohio State Champion and rode at 10 Ohio tracks, a few in New York and Pennsylvania and competed in everything available in Canada. He has had many sponsors and supporters over the years; most noteworthy is Jeff Hartrich of American Harley Davidson in Tonawanda N.Y.
Erie County Fairgrounds’ track at Hamburg, New York has been a jinx for many riders either on the track or traveling to it and Chris was no exception. He took a nasty spill and when he came to, he couldn’t talk, walk or see and doctors revealed that his neck was broken and he likely wouldn’t walk again. Either determination or stubbornness caused Chris not to give up and he literally stared at his toe until it began to move. The paralysis only lasted several weeks. Chris walked around with a halo fixture around his head to keep it immobile and within six months, for the love of the sport, he was back on the track and having fun again. On his victory round at Lima, he took his father, George with him and knew that he had achieved what all good racers dream of, to be able to look back some day and know that on that night they finally did it, they were the best. Chris is St. Catharines’ genuine unsung hero, we welcome him as an inductee in the Canadian Motorcycle Hall of Fame and look forward to seeing him compete for many years to come.